The Classical Theatre Project’s Shakesbeer is a perfect storm of good things. 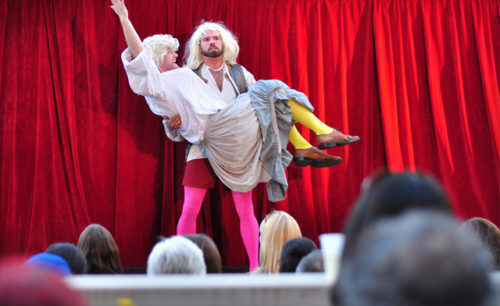 Their production of The Complete Works of William Shakespeare (Abridged), running until August 17th at the Artscape Wynchwood Barns, has become a summer tradition in Toronto. All the things theatre-lovers (or at least this theatre-lover) enjoy – the bard, live music, great acting, and beer – come together to make Shakesbeer one of the most enjoyable shows I’ve ever seen. When I was fourteen, I read my first Shakespeare play (Romeo and Juliet) and drank my first beer. I hated both those things at first, but would come to love them in time. When I walked into the Artscape Wynchwood Barns to be greeted by some lovely live music (by Django Futuro) and beer provided by the Amsterdam brewery, it was like coming home for the first time in years. Make sure to try the Adventure Brew, as it’s a small batch beer made specifically for this event. The show being mounted is called The Complete Works of William Shakespeare (Abridged), it’s a clever play created by Adam Long, Daniel Singer, and Jess Winfield that both parodies and pays homage to its source material. The Complete Works of William Shakespeare (Abridged) hinges on Shakespeare’s works, but it is also a very tight, funny show with a lot of hilarious, original content. The premise is simple: three actors try to condense all of Shakespeare’s works into an 87 minute show. The result is absolutely hilarious; my guest and I were belly-laughing throughout. Each of the actors has a defined role in the ensemble. I was particularly fond of the dopey Jeff Hanson, whose mannerisms and delivery made me think he was the lovechild of Rob McElhenney (It’s Always Sunny in Philadelphia) and Jack Black. Matt Drapel was funny as the dweebish bookworm, and Kevin Ritchie is the closest thing to the show’s straight man (though he’s still ridiculous). They all break frame at times, sometimes to play a certain role, and other times just in their interactions with one another. This results in some of the funniest moments in the show. What’s most impressive to me is how these actors’ honed, impressive skill sets are lurking just beneath their buffoonery. Even though they’re onstage making crass jokes and messing around with the audience, there are moments where their vast experience as trained performers shine through. Small gags with swords show a certain deftness with fight choreo. When they’re playing dead, they do a fantastic job of doing so. On rare occasions, their delivery shifts from comedic to poetic and it’s surprisingly beautiful. The way this show blends the hilarity of modern comedy and a relaxed atmosphere with Shakespeare’s writing helps to make Shakespeare feel very accessible. I wish that this is how I was introduced to Shakespeare in 9th grade (sans the drinking), as I might have discovered my love for it sooner. Shakesbeer promises the bard and booze, and it delivers admirably on both fronts and then some. My guest and I were enthralled. I would go back to see this show again before it closes, I would buy tickets as a gift for someone else, and I will definitely spend the year looking forward to seeing it next summer. Shows dates vary. The next performances are Aug 10th and 17th with shows at 6:30 & 9 PM. You can buy the tickets online or at the CTP Box Office.